Norma Alvarado at work installing a 20 MW solar power plant in Corcoran, CA. She clocks in at 5:25 a.m. and starts her day at a safety meeting with 119 other workers from the Fresno Ironworkers Union Local 155. 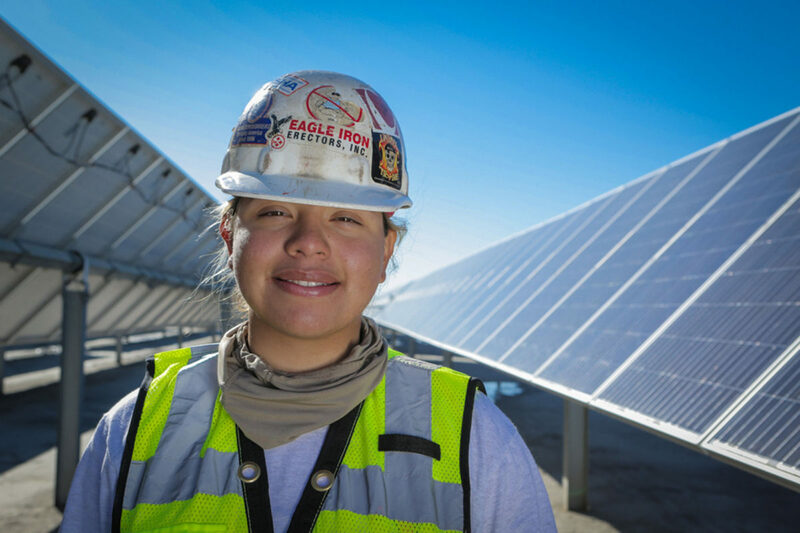 Part of a four-year apprenticeship training through the union, this is her first hands-on job out in the field, installing 70 megawatts of commercial solar for a private company. Norma is the only woman in her class of 75 apprentices. She’s 18 years old and just out of high school. She had been working at McDonalds, but had a hard time making ends meet on fast-food wages. “You work too hard for too little pay. So, it’s a struggle,” she comments. This job will take the installers seven months and another large solar job will follow on the I-5 corridor on the west side of the Valley for Panoche Valley Solar, according to Don Savory, business manager for Local 155. A solar plant in Corcoran follows that, supplying clean power into transmission stations in the Central Valley, notorious for some of the worst air pollution in the country. The influx of commercial solar work has tripled the size of the Ironworkers’ apprentice program, which teaches all aspects of ironwork, not just solar. “We went from 60 to 178 within a year. It’s been a tsunami,” Savory says. The solar work has taken off due to federal tax incentives and state policies such as California’s Renewable Portfolio Standard, which requires a minimum percentage of the state’s electricity be provided by renewable technologies like wind and solar. Recently passed legislation, Senate Bill 350, raised the target to 50 percent by 2030, making it one of the most ambitious in the world. “The Ironworkers and the contractors we work for consider SB350 a win-win for California construction craft workers, the economy, and the environment,” says Savory. And, he says he prays they continue to extend solar tax credits, policies and standards because it helps the economy in California’s Central Valley, just now recovering from some tough recession years. “All of this money comes back into the community and local tax coffers,” he explains. “There’s so much unemployment in the Valley, it was like an unemployment office here. We’ve been successful in hiring a lot of them for the solar. Word is out there. We’re absolutely swamped with solar work until the end of 2016,” Savory adds happily. Local 155, based in Fresno, covers 14 counties in the Central Valley and many of the big jobs are outside of Fresno. In addition to hands-on learning at the solar job sites, the apprentices attend classes at the Ironworkers’ Fresno training facility. The apprenticeship has helped Norma in other ways, too. McDonalds didn’t provide her health insurance or benefits and she wasn’t able to afford to check on her health or to get the glasses she needs to wear full-time. But with her strong insurance plan through the union, she’ll be able to get two pairs of glasses for the price of a co-pay. Norma’s fiancé, Pablo Villagrana, is a journeyman ironworker and went through the four-year apprenticeship. He’s now a foreman at the Monterey Bay Aquarium. When Norma expressed interest in the apprentice program, he said, “Go try solar; it’s easier.” And he lent her his tool belt until she could afford her own tools. There’s a long tradition of ironworkers carefully handing down and sharing their knowledge and specialized tools, many of them hand made, with new apprentices. Norma carries a ratchet and bolt bag to attach actuators to panels to track the sun. Savory says the solar work is more accessible to women and older union workers because materials are not as heavy as some of the ironwork. 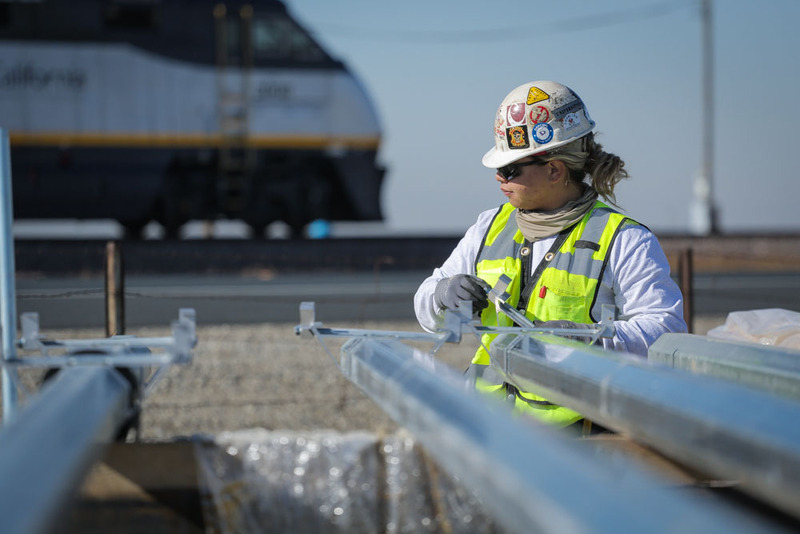 For example, other Ironworker projects involve installing rebar for high-speed rail projects, reinforcing structural steel girders, building architectural paneling, prison furniture, handrails and stairs, and they do maintenance at Diablo Canyon nuclear plant. The apprentices learn it all and then they generally pick a niche, like connecting girders, installing decking, or tying rebar. The solar work requires a lot of walking, but Norma says the work is actually pretty easy for her. “The heaviest thing you carry is an actuator,” she explains. The actuators are an important part of the installation because they allow the panels to move to track the sun. She also carries a bolt bag and a ratchet to attach the actuators. 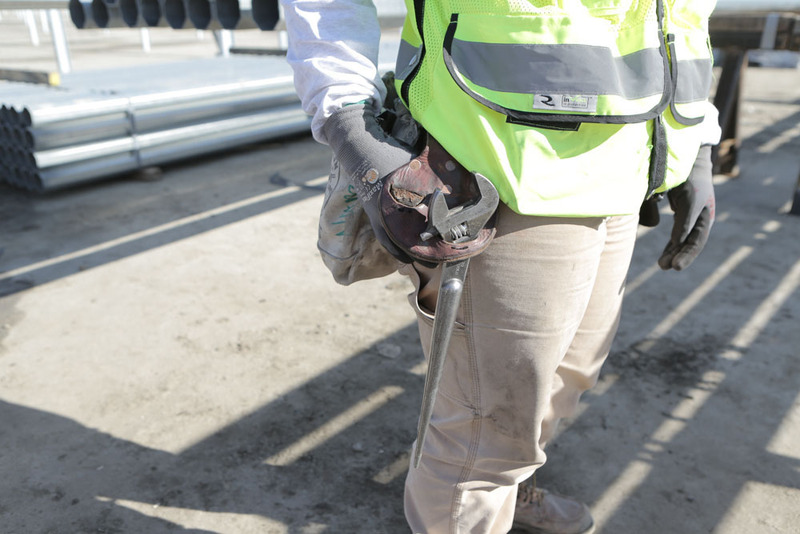 Norma prepares mounting rails that support the solar panels. “I want to make a life for my kids. I don’t want them to grow up in the environment I grew up in,” she explains. Going through the apprentice program is her way forward. When Norma was younger growing up in Fresno she had very bad asthma. As she grew up she learned about the connections between air pollution and the high rates of asthma in her hometown and surrounding area. Her symptoms diminished as she grew up. “I do have an inhaler but haven’t had to use it in a long time,” she says. Experiencing breathing problems as a child makes installing solar and providing a clean energy source rewarding for her as an adult. “It makes me happy because even though my asthma is better there are a lot of other people who have the same symptoms,” she reflects.